Gallia Academy girls basketball coach Jordan Deel stands at the top of the gymnasium, following an open gym workout on Thursday in Centenary, Ohio. CENTENARY, Ohio — The Blue Angels have a new leader. At a recent meeting, the Gallipolis City School District Board of Education approved the hire of Jordan Deel as the next varsity girls basketball coach. Deel is replacing Joe Justice, who in five seasons with the Blue Angels recorded a 49-68 overall record, with a pair of players joining the 1,000-point club. GAHS had just one senior graduate from last season’s 10-13 squad, which was the No. 4 seed in the Division II postseason, but was ousted in the sectional semifinal by Fairfield Union. Last winter marked the second straight campaign in which the Blue Angels reached double-digit wins. 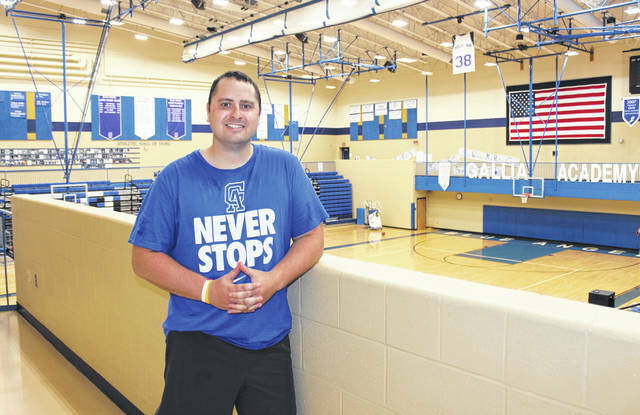 Gallia Academy Athletic Director Adam Clark hopes that hiring Deel will keep the program moving in the right direction. Deel — who ran a successful youth camp for around 50 players earlier in June — shares Clark’s belief for the future of Gallia Academy girls basketball, and has already made efforts this offseason to make the Blue Angels a success for years to come. Deel — a 2009 graduate from River Valley High School and a 2014 graduate of Ohio University — spent four years as an assistant football coach for the Blue Devils, beginning in 2013. On the hardwood, Deel coached the GAHS freshman boys basketball team to a 10-5 record in the 2016-17 season, and then led junior varsity Blue Devils to a 18-4 mark last winter. With August as the no-contact period, Deel is hoping the rest of the offseason will have the Blue Angels as ready as possible by the time the first practice rolls around in late October. Among early goals for the GAHS girls basketball team are winning their first-ever Ohio Valley Conference championship, as well as a return to the district tournament for the first time since 2006.